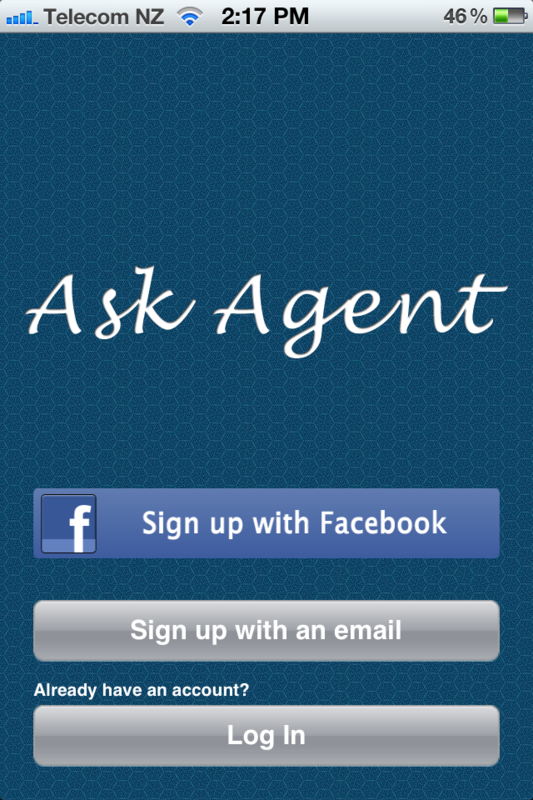 Ask Agent is designed for people seeking assistance on complex questions or problems. Think of it as a super smart Research Assistant, ready to work for you wherever you go. Simply speak your request to your phone (or type it), with as much detail as you want to supply (more the better). Ask Agent instantly puts together a team of skilled researchers who search all over the Internet to deliver fast, quality-vetted results directly to your email. You can ask absolutely anything you want, using your natural language, on any topic, from business to travel to career advice. Anything at all. You can even attach a photo to your request (e.g. "Can you please provide me more information about this style of house?"). - The CEO of a cosmetics company wanted to know the best sustainable business practices for a consumer packaged goods company (such as Colgate, Estee Lauder, Procter & Gambel, Sunsilk, etc). - The representative of a central bank in Africa wanted to know how countries around the world regulate pyramid schemes. - A traveller wanted a 5-6 day itinerary for himself, his wife and four-year-old daughter in Los Angeles. - An Internet entrepreneur wanted to know about consumer data protection laws in Europe...and many more! Ask Agent saves time, money, and most exciting of all -- you no longer need a computer and Internet connection to access all the research of the web. All questions are processed anonymously and confidentially. 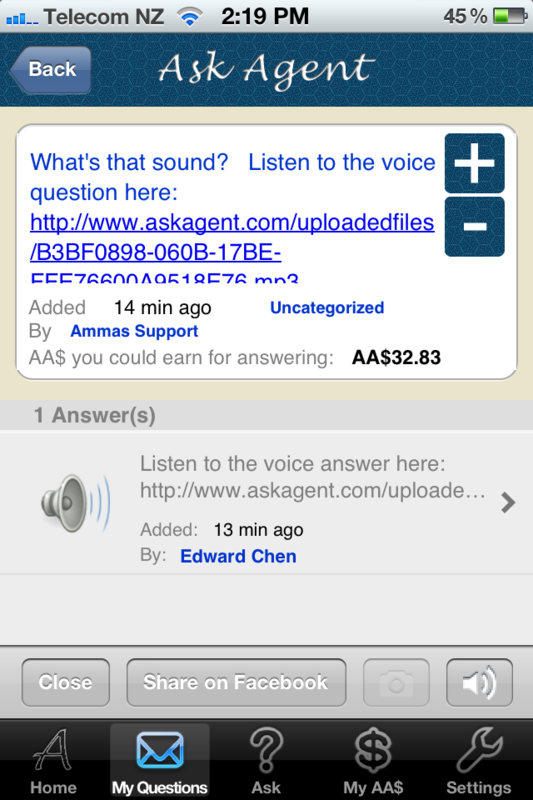 Ask Agent comes pre-loaded with 5 query credits, ensuring 4-10 researchers will work on your question or problem. The more credits you put on your query, the faster and more intelligent answers you'll receive. For help or support, contact info@answerpod.com. * A complete revamp of UI/UX. * New feature allows you to adjust Speed, Quality and Quantity settings for your question submission. * New feature allows you to submit voice recorded questions. 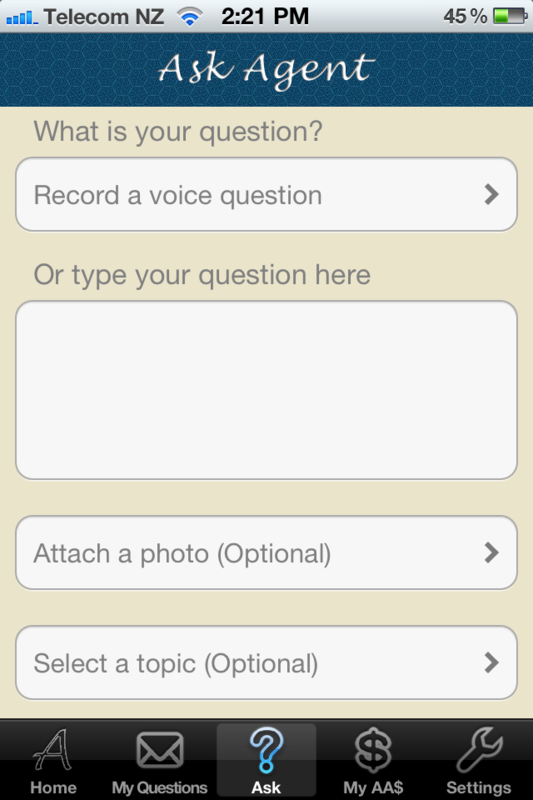 * New feature allows you to answer other people's questions either by typing or voice recording. * New feature allows you to upgrade your account by purchasing AA$ using in-app purchase. * New feature allows you to sign up via Facebook. 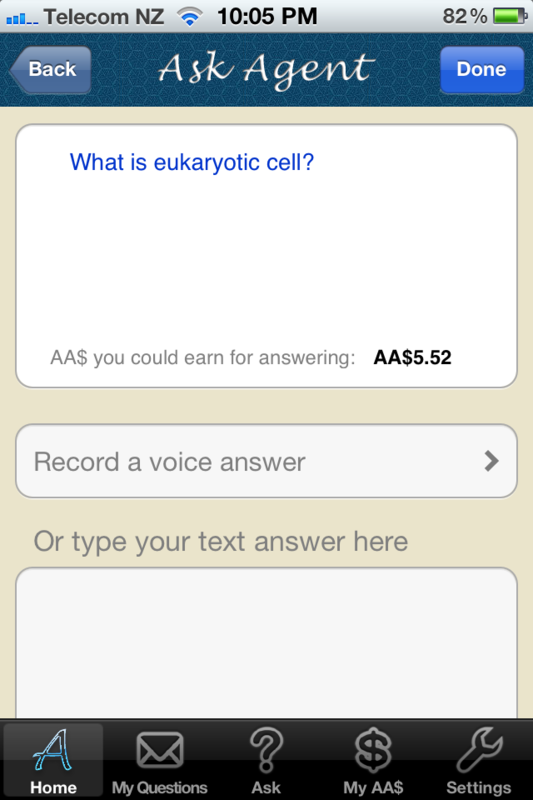 * New feature allows you to view your asked questions and answers you have received, also allows you to close questions. * New feature allows you to share questions and answers on Facebook. * New feature allows you to register your expertise. * New feature allows you to view your AA$ and US$ balance. * New feature allows you to change your account settings, profile and notification settings. * New feature allows you to be notified via Push notification for new answers.